Band heaters apply heat to cylindrical surfaces using conduction. They are insulated with either ceramic, mica, or mineral insulated materials to reduce heat loss. 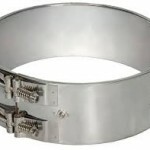 Nozzle heaters are small diameter band heaters designed to heat steel nozzles. 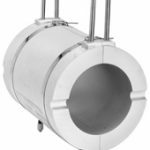 Barrel heaters are larger diameter bands designed to heat Pipes, Dies, and large cylinders. 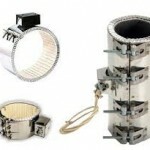 Band heaters can be designed as 1pc construction or multiple pieces to help with installation. We can choose the correct heater band based on your application information. 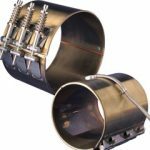 Process Temperature, heat-up time, and part Size make a difference on which style of band heater is best for you. Our sales engineers can help you with your selection. We work with application support as a no-charge curtesy to our customers. Take advantage today. Our experience is your advantage. Band heaters attach to the objects they heat. 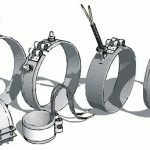 There are several clamping options and termination styles, depending on the application.